Women in technology may generate a lot of press, but the statistics could stand improvement: The percentage of computing jobs held by women has fallen over the last two decades. In fact, a study released earlier this year by the American Association of University Women showed that just 26 percent of computing jobs in the U.S. were held by women as compared to 35 percent of those jobs in 1990. Kay Kapoor is working to turn the tide. As President of AT&T Government Solutions, Kapoor not only leads more than 4,000 federal IT professionals, she also finds time to mentor young professionals and students in STEM. “We need to continue to encourage students to pursue STEM careers and help guide them as they take the journey,” says Kapoor. “For young women, in particular, it’s not easy to go into these fields without encouragement from people they can trust. As technology leaders, we have a responsibility to support STEM efforts and offer guidance to young professionals.” See how Kapoor is helping inspire new generations of women in STEM, and what opportunities lay ahead in this growing field. WashingtonExec: Tell us about your work mentoring young professionals and students in STEM. Kay Kapoor: I’ve spent most of my career as a champion of STEM. When you think about the world we live in today, it is imperative we focus on STEM and support its pursuit by young professionals. We live in amazing times. Mobile devices give us the power of mainframe computing in our hands. Robots make our cars, clean our carpets, and serve as personal assistants. We’re using tele-health solutions to support patient treatment, building driverless cars and using drones to assist in warfare as well as deliver packages. None of this would be possible without significant advances in science, technology, engineering and math. And because my career has been shaped by these four tightly interwoven subjects, I have become a champion for the STEM movement. I currently mentor several different professionals at various levels in their respective careers, both in industry and in government, each of whom is clearly passionate about their own career path in STEM and hungry to learn. I also speak often publicly about the value of mentoring in STEM fields, most recently to a gathering of students, faculty, and regional business leaders at my alma mater, the Carey Business School at Johns Hopkins University. WashingtonExec: Tell us about a STEM mentor who had a profound impact on your life. Kay Kapoor: STEM as we understand it today did not exist when I was starting my career. I was intimidated, at first, about pursuing a career in technology. But my early mentors encouraged me to try it. I saw the opportunity of a career in Technology and signed up for math and science. I loved the course material. I loved the curiosity and “thirst for more” that science and engineering create. Over the years, I have been the beneficiary of several STEM-related mentoring relationships. I am grateful to those mentors for their generosity of ideas, advice, relationships, and wisdom. Mentors have helped me see the bigger picture in certain circumstances and have also taught me invaluable advice about core leadership principles. A key benefit of the mentoring relationships in which I was the protégé was the attainment of a certain amount of self-confidence and learning to trust my instincts. WashingtonExec: What differentiates AT&T’s STEM program from others? Kay Kapoor: AT&T is actively involved with the STEM programs we donate to and is investing time as well as resources. For example, AT&T works with We Teach Science, a non-profit that digitally connects students to mentors (including many AT&T volunteers). These mentorships last for years, and AT&T is taking a hand-on approach through its Aspire Mentoring Academy by providing 1 million hours of student mentoring by AT&T employees through the end of 2016. AT&T has also teamed up with organizations such as Girl Scouts and Girls Who Code to inspire girls to pursue STEM careers. We have a longstanding reputation as a company that has the best talent — both men and women — at the table, and there are more than 19,500 women at AT&T who work in STEM roles. WashingtonExec: Last year you were selected as one of the Top 50 Women in Technology. What academic and professional choices paved the way for that distinction? Kay Kapoor: The Top 50 Women in Technology accolade is a humbling honor to receive and I’m grateful that my work is recognized by the industry. I pursued and earned my bachelor’s degree in Information Systems from the University of Maryland and went on to achieve my master’s degree at the Carey School of Business at Johns Hopkins University. Along the way, I raised two sons, took night courses, and supplemented my education by enrolling in executive programs at both Harvard and M.I.T. My education gave me the foundation to pursue my career in technology and served as an excellent platform for me to enter the field of information technology. I got my start as a software developer at Lockheed Martin. That led to management of technology projects. During the next 20 years, I ran larger and larger organizations, ultimately becoming VP and COO of their Civil Government Unit overseeing 13,000 employees and about $4 billion in annual revenues. Seeking to broaden my horizons and lead a management and technology consulting organization, I left Lockheed to become Chairman and CEO of Accenture Federal Services. After a few years, opportunity knocked again, and I took my current position at AT&T because I saw that mobility, cloud and the Internet of Things were dramatically changing the world. I recognized that AT&T sat at the center of this technological revolution and I really wanted to be a part of how we deliver these capabilities to help our customers. WashingtonExec: What inspired you to get a degree in information systems years ago? And how has that degree helped you today? Kay Kapoor: I arrived in the U.S. as an 18-year-old university student from my native India. Although I came from a family of STEM champions, I was not a math or science enthusiast originally. But I saw opportunity in computing and believed in its promise for the future. I guess you could say opportunity was my inspiration. Also, I was strongly encouraged to pursue a career in technology by family and friends. Young women, in particular, need encouragement to pursue careers in STEM fields. By pursuing and achieving my degree in information systems, I built the foundation for a successful STEM career, specifically in engineering. In our industry, it is important at all levels of the organization to be able to cogently speak about the science and technology that underpins the technology solutions we create and deploy. WashingtonExec: For those who get degrees in liberal arts, how can they effectively learn about STEM — and find a foothold in a STEM career? Kay Kapoor: Learning doesn’t stop at schools and universities: it’s a lifelong process. Those who want to pursue a STEM career, regardless of their original college degree, can re-train to acquire the necessary skills. For example, nanodegrees offer affordable, online training and credentials to students everywhere for high-demand tech jobs. A nanodegree is a compact online curriculum designed to impart the skills employers believe are key to get a job in technology. At AT&T, we offer a nanodegree program that teaches basic programming skills to help students qualify for entry-level programming and analyst positions. The nanodegree program is part of our ongoing commitment to prepare students for success in the workforce. We recognize nanodegrees as a great way to find talent. We’re providing up to 100 paid internships for nanodegree graduates. WashingtonExec: How have you helped your own children pursue careers in STEM? Kay Kapoor: I have two sons, both of whom have excelled at math and have a strong interest in pursuing careers at the nexus of business and math. I work with and encourage them in much the same way that I mentor others. I try to inspire and feed their growing passion for finding meaning and answers in numbers. Rather than sharing the answers and solutions to their questions, I try to lead them so that they discover those answers themselves. It’s often more about encouraging them to think on their own and to develop confidence in how they approach challenges, whatever field they eventually choose. WashingtonExec: Where will your future STEM mentoring activities take you? What’s next? 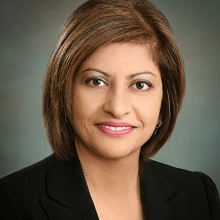 Kay Kapoor: I hope to continue my work in STEM and to remain active in multiple industry associations and organizations that focus on technology and its application for government and commercial purposes. Through that work, I find opportunities to reach out to young professionals, particularly women, to mentor them, foster their interest in STEM or just share what I’ve learned over the years, formally or informally. For example, not too long ago I led a mentorship panel and workshop for the Armed Forces Communications and Electronics Association (AFCEA). I’m also involved with the Society of Women Engineers and Women in Technology. I mentor several AT&T employees. I’m a huge believer and participant in mentorship on both sides of the mentor equation – as a mentor and as a protégé. In addition, through AT&T and the organization I lead, AT&T Government Solutions, I am actively promoting opportunities for STEM students focused on programming. To promote interest in STEM-related subjects, in just the last 60 days, we’ve organized two separate hackathons for up and coming programmers: one focused on mobile apps and another on Internet of Things solutions. My commitment to STEM and to helping young students pursue a career in STEM is ongoing.